• Comfortable ergonomic design with silicone eye gaskets and anti-pinch nose bridge. 1.Do not drop goggles on hard surfaces. 2.Check lenses for scratches and cracks carefully before use. 3.Children should use under adult supervision. 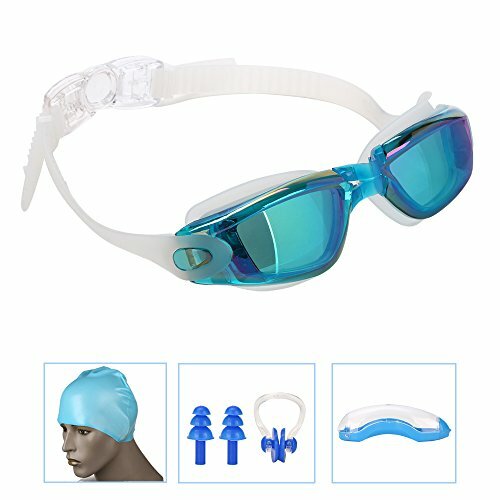 Stylish Swimming Goggles Set : Swimming goggles + swim cap + nose clip +2 pairs of ear plugs and protective case. Fits men, women, kids as well as match any kind swimwear/bikini . No leaking: Ergonomic completely sealed silicone protective circle design prevent water from entering your goggles, and help to reduce the pressure around the eyes, keep your eyes dry and comfortable. Comfortable: The headband is made of 100% soft and elastic silicon, comfortable to wear, as well as prevent eyeglass slipping during swimming. Adjustable headband offers different size options to fit any size. UV Protected : UV protecuted lenses block the sun's harmful UVA and UVB rays. Silicone Swimming Cap : Lightweight, latex-free silicone provides durable performance and optimum fit, protecting your hair and ear from bacteria, chloride and other substances in the water. 90 days money back warranty ! If you have any questions about this product by Onioc, contact us by completing and submitting the form below. If you are looking for a specif part number, please include it with your message.